While spider veins and varicose veins are not normally a health concern to worry about, our clients come to us in Rockville Centre for cosmetic treatment to minimize the appearance or alleviate discomfort. Visible veins give the appearance of premature aging or might make you feel self-conscious about your skin, especially if you notice veins in areas that are not easy to cover with clothing, such as your hands or neck. Fortunately, Long Island Dermatology offers a simple and quick treatment option so you can go back to enjoying your daily routine with your best possible skin. Spider veins and varicose veins are small veins located close to the surface of your skin that appear dark or raised. Varicose veins are typically linear, while spider veins, like their name suggests, are a visible “web” of veins clustered around an area of your skin. Men and women of all ages can develop these conditions, which are often hereditary. Though they are not a health concern in general and don’t present any risks, some patients report discomfort when they have large concentrations of these veins, including itching, swelling, cramping, or throbbing sensations. Even if these symptoms are mild, most patients don’t like the aesthetic appearance on their arms or legs. Any adult who is bothered physically or aesthetically by varicose or spider veins can schedule a treatment in our office. At Long Island Dermatology, we offer a simple, noninvasive treatment option to shrink and erase both varicose veins and spider veins. Sclerotherapy is a medical procedure performed in our office that includes a series of tiny fluid injections. The fluid naturally closes off the veins with abnormal valves close to the skin, rerouting the blood to other, healthier veins and allowing the visible areas to be absorbed slowly into the skin. To make these veins disappear. The sclerotherapy procedure is completed in fewer than 30 minutes in our office, leaving you with very little need for recovery time. In general, you’ll be able to return to all your normal activities immediately after vein therapy. 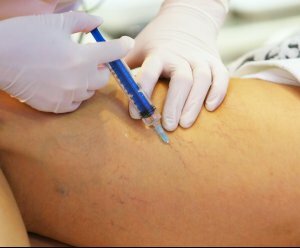 During a sclerotherapy treatment, our dermatologist begins by injecting a saline solution directly into the affected vein(s). The solution causes swelling in the vein (but minimal discomfort), which in turn prompts the body’s natural healing reaction. During the healing process over the following weeks, scar tissue forms and blocks blood flow to the ends of these veins. Since there is no blood in the veins, they are no longer visible and can be absorbed into the body naturally. After the abnormal veins have closed and blood is rerouted, blood circulation overall will be improved, and any painful symptoms of varicose and spider veins will disappear along with the visible dark lines themselves. Schedule your vein therapy treatment with our Rockville Centre dermatologist today by calling (516) 272-4193.